I have been on a bit of a “blog-iday”, taking a break from all things cancer while I focus on other pursuits and await the results of my early April MRI. I am pleased to be able to report that I received a “stable” result, which means no change in the tumour. That’s two full years since my first diagnostic scan, with no change in the watchful waiting approach, because there’s been no change in the tumour. I have not had any medical treatment, no chemo or radiation, during that time. Not because I was against it, but because my team of doctors more or less agreed that these interventions should be reserved in a future arsenal, and if this tumour remains well-behaved with slow growth and doesn’t display any aggressive conversion or invasive characteristics, we can all happily co-exist. The only treatment I’ve employed is a dietary overhaul, going to a low carbohydrate, high fat ketogenic diet over a year ago. See my one year diet report here. I cannot say without doubt that this diet has prevented growth or spread of my tumour. I can say it didn’t hurt. I recently had my annual physical, my first after starting this diet in March 2013. I came through with no concerns. Normal cholesterol, normal thyroid function (which had been a little sluggish in the past). I am living proof that eating fat doesn’t make you fat! I was excited some weeks ago to receive a copy of Ellen Davis’s book Fight Cancer With a Ketogenic Diet: A New Method for Treating Cancer. I’ve read and re-read it during my hiatus. I love it. I wish I’d found it last year when I started this diet. It would have made things so much easier. One of the chief challenges I encountered was that so much of the information available online about a ketogenic diet is framed for weight loss. I was continually frustrated in trying to navigate through the overwhelming amount of information out there on low carb, Atkins, Paleo, keto diets, and trying to tease out the information that applied to me. I wish I had found Ellen’s book sooner, because it’s all here. I need to see the science behind what I’m reading, and I want to satisfy myself that it makes sense to me. This is, for me, the number one strength of Davis’s book. 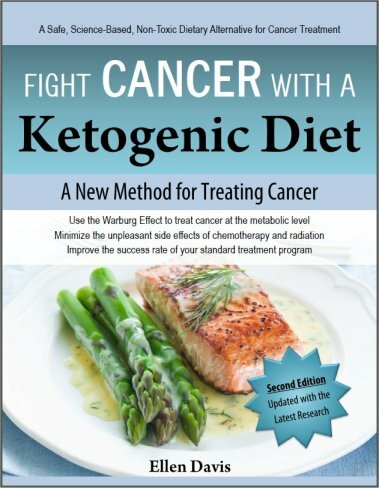 It presents the scientific support for using a ketogenic diet to fight cancer in an accessible manner that is written with the layperson in mind. And it supports that with links and references to the source materials, for people who want to do a deeper dive. What I was really looking for when I started researching dietary interventions for cancer was essentially answers to the classic who, what, when, where, why and how’s of it all. Davis’s book really lines up all of this information for an overwhelmed reader. From what the diet is and why it can fight cancer, who leading researchers are in the area and what their research shows, to who should NOT follow such a diet, the top of mind questions are all covered in dedicated sections. And there is a lot of “how” information, which is also tremendously valuable to find collected together and set out logically for you. How to start, how to monitor progress, how to customize the diet, cooking techniques, it’s all here. There is also a wealth of information on the questions that pop up as you start out – how much water do I drink, can I drink alcohol, what’s the role of fasting, how do I eat out at restaurants, what to do when travelling, how long to do it, what role does or should exercise play, what about medications and illness, what if I’m a vegetarian? One of the key things I wanted help with early in my diet was understanding how to know whether what I was doing was working, and the section in the book on Monitoring Progress in Chapter 4 is very well done. It motivated me to get out my blood reading meter and re-visit my own data collection again. I spent about a week finding the same information last year when I started, and arrived at the same blood meter recommended in the book, used in the same manner. I had to experiment to arrive at a schedule for when to take readings, which Davis sets out for you in this section, and again would have been useful for me. Finally, there is a great deal of valuable information provided as appendices, including recommended supplements, worksheets for calculating calorie requirements and macronutrient levels, food diary templates, etc. Davis incorporates a “food exchange” system that allows the user to think about carbohydrates in a sort of points system that could be less onerous for some patients to wrap their minds around than worrying about grams of macronutrients in everything they consume. I have already recommended this book and Davis’s website to a number of folks who ask me about my diet, and received feedback that matches my own impressions. This is a valuable resource for anyone working on understanding how to make dietary and lifestyle changes in the face of a cancer diagnosis, or that of a loved one. Ellen’s book is available at her site, below, in ebook format, which makes following links to other external sources and information easy. I would like to thank Ellen Davis for providing me a copy of her book free of charge. My son has followed the ketogenic diet since his diagnosis (Grade 4 GBM with p-net elements) in May 2013. After a punishing treatment regime which included surgery, chemotherapy and radiotherapy, his MRI was clear. He was already gluten free and ate healthily, so the change in diet wasn’t as bad as it would have been for pasta loving me, but it is expensive…and totally worth it. Hi, Stella, thanks for reading. It sounds like your son is a warrior! Are you familiar with maxloveproject.org? I just discovered this site and Max’s family’s story, there are some wonderful resources there for families of children battling childhood cancers. Best to you. Thank you so much for taking the trouble to let me know of such an incredibly moving organisation; one of the positives of this nightmare has been the people we have met, virtually or in person. My son is 24. Along with us, his family and girlfriend, he is supported by several British charities (Most notably CLIC Sargent and Teenage Cancer Trust) and is lucky to live close enough to The Penny Brohn Cancer Care Centre, Bristol, who I cannot praise highly enough…and they have a shop where we can buy some of the more obscure keto ingredients. Today I picked up a bag of dried white mulberries. Still investigating their keto – friendliness – have you come across them at all, I wonder? Stella, I 100% agree with your comment about how it’s the people that make the journey, in so many cases. Your son is fortunate to have what sounds like a great support system, I do too, and I always wonder what it must be like for people who don’t have this. I know how fortunate I am for that. On the topic of the mulberries, I’ve heard buzz about them in anti-cancer circles, I think Dr. Oz featured them on his show awhile back, so the mulberry market benefitted from the “Dr. Oz effect”. I always say that people need to follow their own light with regard to trying out alternative therapies. With respect to keto-friendliness, I suspect not so much, just because most fruit is sugary, and even more so in a dried form. A quick Google tells me a 1/4 cup serving has 18g net carbs (total carbs minus fibre), so that’s pretty high for a keto diet. That’s the entire carb target for a lot of people for a whole day on a strict keto regimen. Best wishes to you and your family. Simply adding some uncooked potato starch (not flour) to the diet often reduces BG by 10 points, in addition to the other interesting effects. Whether you try exogenous ketones and/or RS, I’d say that the glucometer rules. I’m about to order one, just out of curiosity. I suspect that optimal BG may be up for debate soon, too. The consensus dogma numbers may be too high for ideal health. Dr. Davis (“Wheat Belly”) recommends no higher than 90 mg/dl fasting and no higher than 100 postprandial (although ideally NO RISE postprandial). I wouldn’t be surprised if future recommendations settle on a fasting BG somewhere between 70 and 90 (for people already adapted to fat metabolizing – might be hypoglycemic for those just off a full time glycemic diet). Wheat Belly, by the way, is only a borderline keto diet, but the recipes in the WB cookbooks are easily adapted to full keto. Hmmm. RS for cancer needs a deep look around. Yeah…good example. I try to maintain a balanced approach to lifestyle, even in the face of what most people consider an “extreme” diet. I feel confident in the data behind the keto diet. I find one constantly has to guard against getting sucked into fads or new “cures”, however, and tweaks of good research often fall into that category for me. I like to follow it, but I don’t want to chase rainbows 90% of my time, either. I’ve got other living to do! I’ve been seeing more and more about RS, too, Boundless. I want to investigate further. I see different information from different sources on optimal G/K ratios also. I think we have to remember that some numbers get lifted from original sources, and sometimes they were achieved in a mouse fed a fat cocktail vs. others fed chow or something, so evaluating what is reasonable for a “normal long term human diet”, well, we need to maintain some perspective. On the topic of the blood meter, I like playing with mine, but I can be a data junkie and get too absorbed with it and forget that I also can tell when my diet needs reigning in by how I feel and how my body responds. I have to take breaks sometimes, or my life would be ruled by finger pricks and digital readouts and I don’t want that, just for my own personal mental balance! But definitely a good tool to use for a week or so here and there to generate some data. Or I use it to test food tolerances that I’m unsure of. Greymadder, you need to look into adding a report-abuse button or link to Replies. Whatever filters are in place are not catching the off-topic spam comments with user ID spam links. Reblogged this on Health from A (Abdominals) to Z (Zucchini). I would like to purchase Ellen’s book. I would also like to know what her recommendation for the best ketogenic diet cookbook to buy. You can reach her through her website, just search Ellen Davis ketogenic diet. Thanks for reading.